In early spring, just after the snow melts, my eyes are drawn daily to the far side of the narrow planter in front of the RDG office, watching for the noses of Baptisia australis to poke out. The thick, stubby shoots that emerge from the rhizomes resemble asparagus. Although poisonous to mammals, native American tribes used this plant for medicinal purposes. 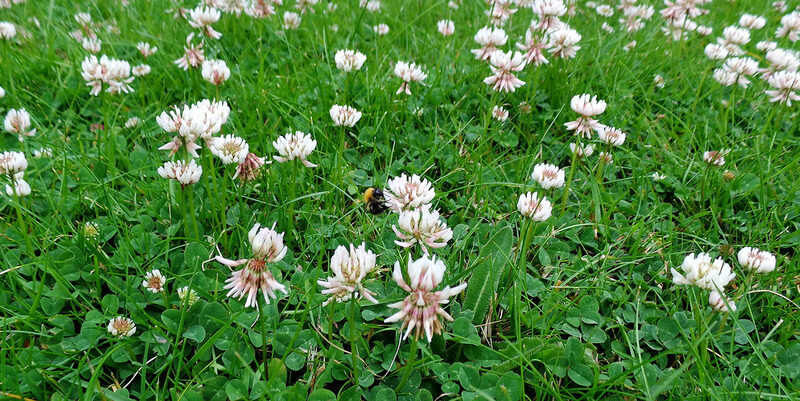 The name refers to its use as a substitute for the superior dye-producing plant from Asia, Indigofera tinctoria. The genus name Baptisia can be traced to the Ancient Greek bapto, meaning “to dip” or “immerse,” referring to its use as a dye. The Cherokee used it as a source of blue dye, a practice later copied by European settlers. They also would use the roots in teas as a purgative or to treat tooth aches and nausea, while the Osage made an eyewash with the plant and gave the dried seed pods to children as rattles. The young green seed pods will lengthen and darken as the summer progresses. Baptisia lends a striking form and texture to a flowering perennial bed. As a legume, it features the rounded, composite leaves typical of plants in the Fabaceae (pea) family. But unlike the garden pea, whose demure flowers blend into the vines, Baptisia produces 3-5’ tall upright stalks with racemes of bold, striking blue flowers in the spring. Each individual flower is comprised of 5 petals. The flowers give way to bulbous seed pods, which turn charcoal black in the late summer, and are used in dried flower arrangements. The fast-growing emerald green foliage is a welcome sight in early spring, and then provides a solid backdrop for later blooming flowers for the rest of the growing season. The seed pods will last all winter and can be cut back in the early spring before the next season’s shoots emerge. Stately racemes of blue-purple flowers are a welcome sight in Spring. 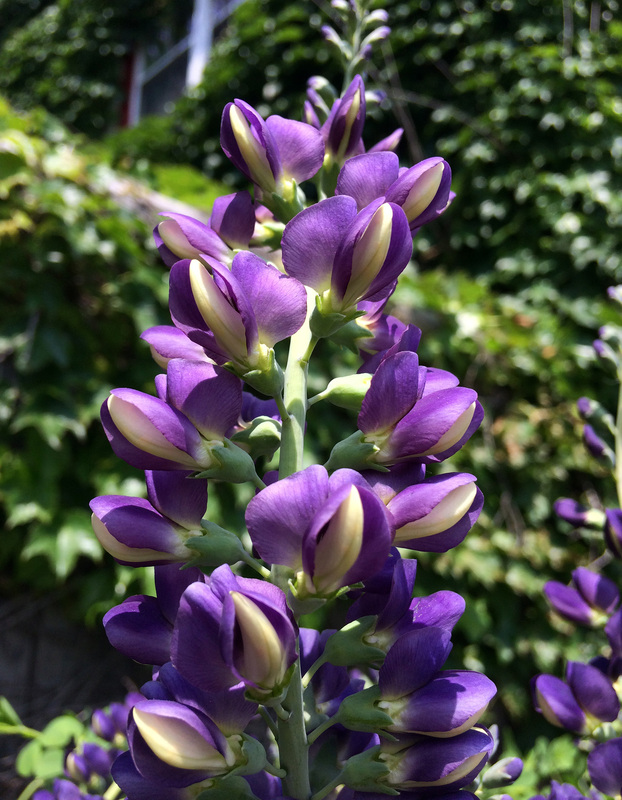 Besides an attractive form, Baptisia bring other benefits to the planter in front of our office. As all members of the pea-family of plants, it fixes nitrogen, adding to the fertility of our narrow stretch of soil. Baptisia is a native host plant for the Wild Indigo Duskywing, Eastern Tailed-Blue, Orange Sulphur, Clouded Sulphur, Frosted Elfin, and Hoary Edge butterflies. These species lay their eggs on the leaves of the plant, which provide the first food for the caterpillars. 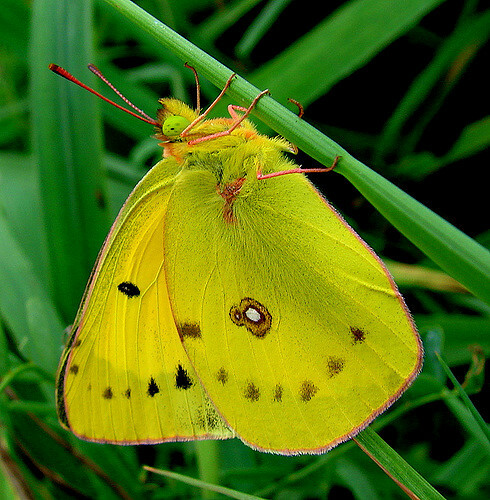 Look carefully if you see leaf damage – it might be one of these beneficial pollinators. Many native bees also enjoy the nectar – although if they are not heavy enough to open the bottom petals of the flower (the “keel”), they have do some amusing gymnastics to get to it. Baptisia is a host plant for the Orange Sulphur butterfly. WikiCommons. + Additional common names of this plant are indigo weed, rattleweed, rattlebush and horsefly weed. + If you break a fresh stalk off, the juice will turn slate blue as it oxidizes. + Baptisia reproduces both sexually and asexually, by producing viable seeds and spreading through rhizomes. That being said, it is not an aggressive colonizer and is a ‘well-behaved’ addition to a garden bed. 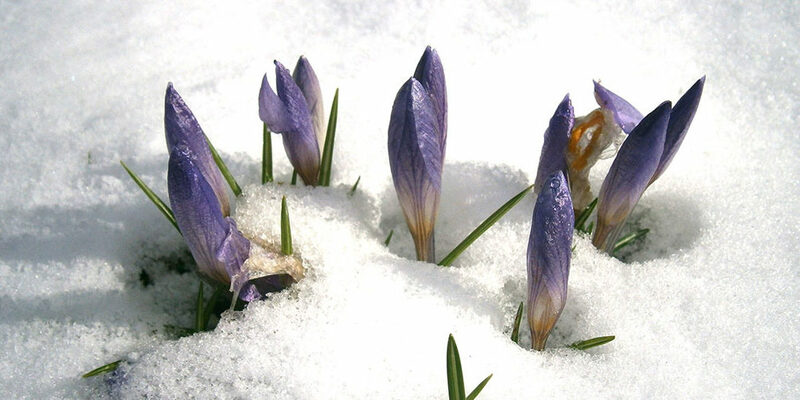 + The seeds need to be stratified, or go through a below-freezing cycle, to germinate. If you want to start plants from seed, it is best to put them directly in the ground or in a pot outside in the late summer and leave them out all winter. Have patience! It may not flower for several seasons. 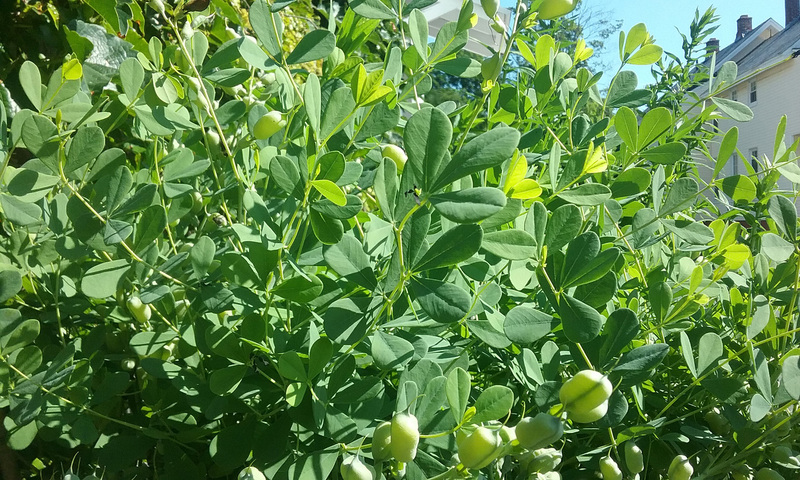 Like most of its genus, Baptisia australis spends its first few years mostly below ground, developing an extensive root system that helps the fully established plant be very drought tolerant. The branching foliage and blossoms become showier and more developed with each subsequent growing season. + With its bitter, astringent taste and diuretic properties, Baptisia is distasteful to deer. So forego the fencing and enjoy these flowers without battling the hungry herds.